As a mommy of two and a professional photographer often hired to shoot birthday parties, I know how special this occasion can be. Each birthday marks a milestone you’ll want to remember as your child grows. Tell the story well, and you'll be able to make an album or photo book - the first in a series - that your family will treasure for years to come. 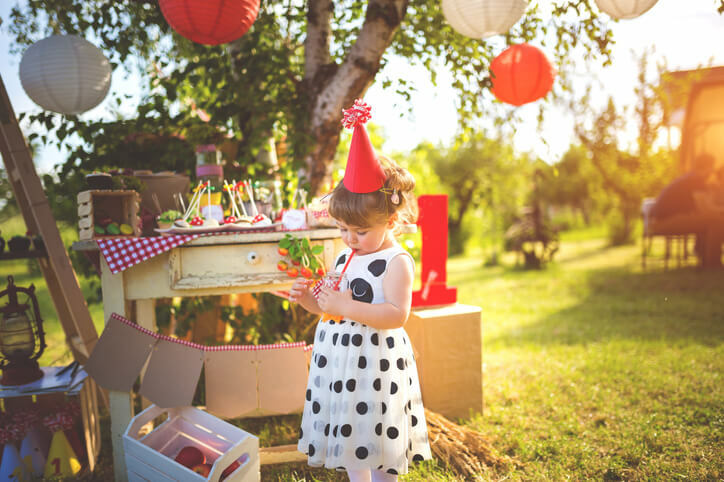 Here are some of my pro tips to help you take your own great party pictures on your child's birthday. The party space will be looking its best right before everyone arrives, and so will the birthday baby. But don't try and do too much that involves your little one. Parents often want me to come an hour early to shoot their child in dressy birthday clothes, and then in party clothes at the party. It's too much for tiny kids. If you have different outfits, take photos of one a day or two before so you don't stress yourself or your kids on the day of the party. I love these. They show the true moments of a party. Instead of making kids stop and smile, just shoot them playing and laughing at their party. Digital cameras still have a "lag time" between when you press the button and when the shutter opens for the photo - and in that time, you can lose the moment you wanted to capture. To reduce that, make sure there's plenty of light where you're shooting. Even better, play around with your camera's settings. You can shoot faster on a manual setting. Some of the most interesting party pictures are shot from a low point of view. Kneel or sit with the babies, or even lay on your belly to shoot them playing. Don't forget to take an overview of the birthday party that shows the room full of adults and children having a good time. This shot will be a great addition to a birthday album or photo book. To get a wide view, you might try standing on a chair or stepladder. Just as important, take close-up pictures of each of the individual babies and children at the party. Later, you can send them with your thank-you e-mails or cards. And in a few years, you'll be able to look back and see the friends your child had at age one! Take close-up shots of objects that represent the feeling of the birthday party: a close-up of the birthday hats lined up on the table, or the gift bags on the floor. Take a cool perspective shot of the birthday banner or a close-up of the cake. When you shoot the cake, take the picture from directly above so you get a birds-eye view that fills the frame. Give your camera to a friend so they can take pictures of your family (including you) around the birthday cake. If you are anything like me, you are not in one single picture! When your child is blowing out the candles, try and set your camera to manual and take a long exposure - you can really catch the ambiance this way. Practice at home first; it could take a little while to master this technique. Have a good time at the party and don't spend the entire event taking photos. Believe me, after a while, your baby will stop smiling for you and get cranky if you’re always behind the camera.